Six weeks before it officially came on the market, Sony Deutschland provided us with their first pre-series model of the Xperia Tablet Z, today's thinnest 10-inch tablet, inviting us to test it out and write a short review. The pre-series status was related to the fact that the software was still in beta, and according to the manufacturer, the display still had a yellow cast visible to the naked eye. We couldn't run our temperature or power consumption tests either, since Sony didn't send the power supply along with their pre-series device. With the series device now in our hands, we'll fill out the missing pieces from our pre-series review, take a look at the changes Sony made for their final release, run our remaining tests, and of course now rate the Sony Xperia Tablet Z. There hasn't been much news of Sony lately -- at least not in the realm of tablets. 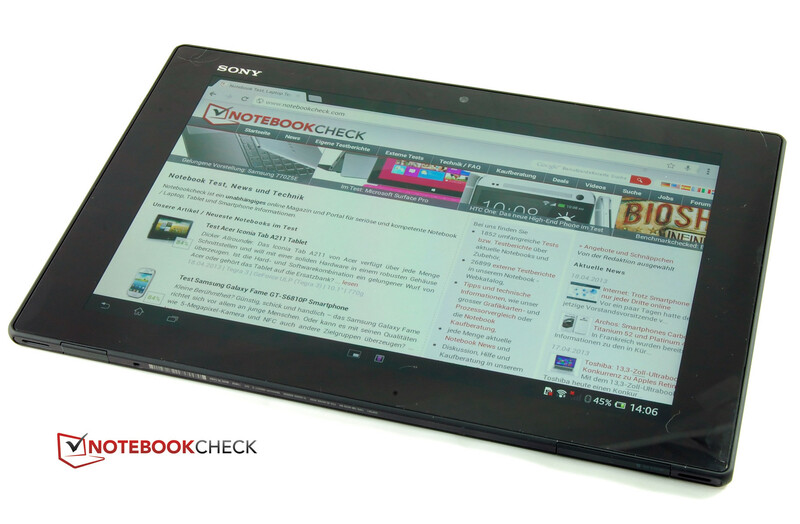 When the predecessor of our current review device came out, the Sony Xperia Tablet S, the electronics giant was doing well. The device achieved good results in our tests and we only encountered minor weaknesses. But shortly after the product appeared on the market, long lines of customers registered complaints regarding the manufacturing quality. It went so far that the Japanese company pulled the tablet off the market. Now, about half a year later, Sony wants to have another attempt and wipe the blemish that was the Tablet S from their record. Sony's design for the Tablet Z departs from the path paved by its predecessor model. Instead of thickening the top third of the backside, the motto is now: flat and light. Its case is supposed to protect the device from water and dust too. All the inner components are top-notch. Sony installed a Qualcomm Snapdragon S4 Pro APQ8064A quad core processor that sits together with an Adreno 320 GPU on the SoC. There's 2 GB RAM and 16 GB of internal memory, expandable via microSD card. Our test model is a variant with WLAN - there's also a model with an LTE module. Both versions exist in both black and white. Sony also announced that they're producing models with 32 GB of internal memory. 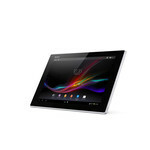 The Sony Xperia Tablet Z is due to arrive on the market in the second quarter of 2013. 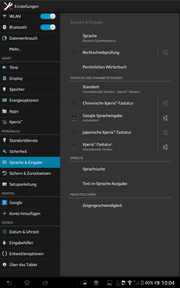 The tablet should also be upgraded to Android 4.2; our test device still runs on 4.1. The recommended prices are as follows: 630 Euros (~$829) for the LTE version, 499 Euros (~$656) for WLAN and 16 GB, 549 Euros (~$722) for WLAN and 32 GB. The backside is made of rubberized plastic. 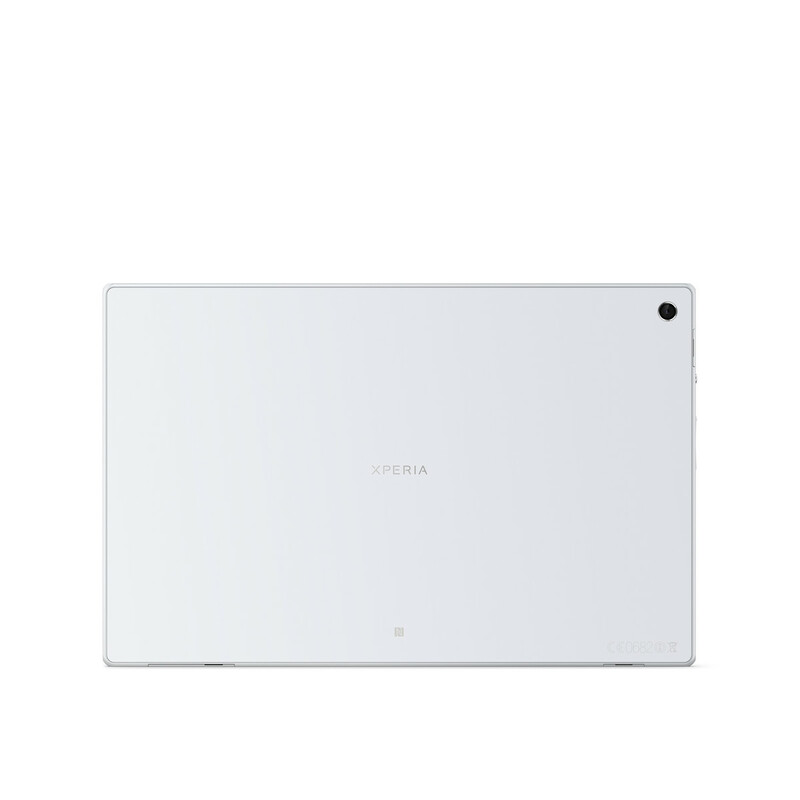 At a thickness of 6.9 mm, the Xperia Tablet Z is currently the flattest 10.1-inch tablet and even flatter than the 7.9-inch Apple iPad Mini. The latter appears thinner because of its rounded edges. The Tablet Z weighs 500 grams - also unrivaled in this size category. Of course in the category of height and width the Sony Xperia Tablet Z can't distinguish itself much from the competition. Sony stuck to rubberized plastic for their material choice. On the one hand that's not surprising, since it would be unrealistic to try to create such a light device with aluminum. On the other hand, the anti-skid surface fits well with the tablet's claim to be rugged; it's also supposed to be water and dust resistant. But the tablet's middle-of-the-road stability isn't quite as fitting. It can be bent very easily and makes a quiet creaking sound when force is applied. 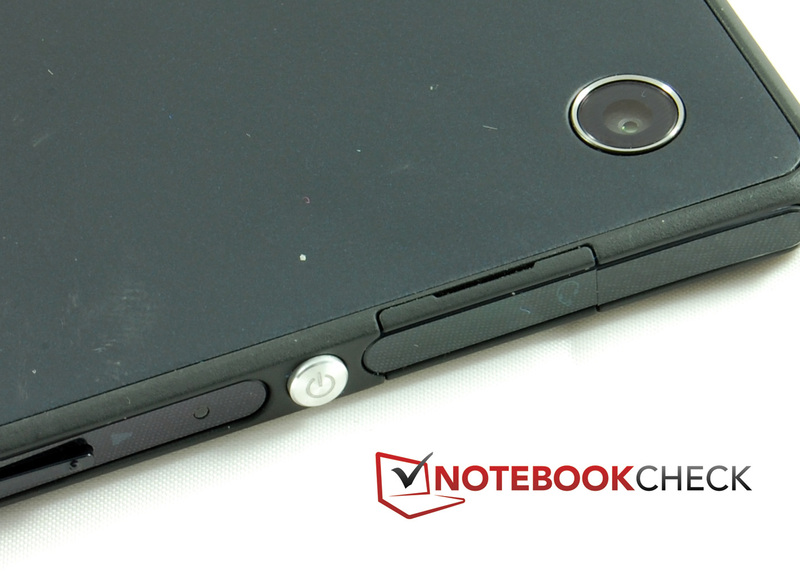 Visually the Sony Xperia Tablet Z's case falls in the "simple and timeless" category. Aside from the rounded edges, the device is very linear. Sony refers to its design as "OmniBalance" with the "distinctive" silver power button, which is the only "dash of color" on the device. 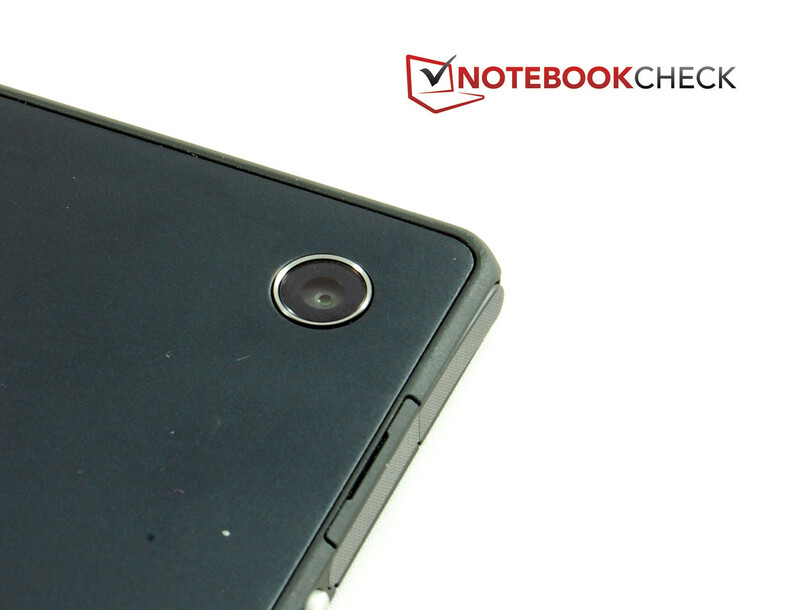 On the whole, the Tablet Z has a very linear and elegant appearance. The black color of our test model reinforces this impression. The IP55/57-rated protection is only noticeable on closer look. Sony managed to seamlessly integrate the dust cover over the connections in the elegant case. Even so, the cover can be opened easily without breaking any fingernails. The predecessor model Tablet S already started to reveal its problems during this portion of our test. In comparison with the pre-series model, nothing has changed here. In its series form too, the rubberized case can still be bent very easily. We of course also tested the tablet's water resistance. Falling water (non-immersion) in the form of rain doesn't pose a threat to the Xperia Tablet Z. The device even withstood a brief, complete submersion without a problem. Noteworthy, however, is the fact that the touchscreen can't be operated with wet fingers. Large water droplets can also act like fingertips and enter undesired input. In the realm of technical components, Sony doesn't do things half-way -- their goal is clearly to stand out among the top models of the established competition. The competition being: the Apple iPad 4, Google Nexus 10, Samsung Galaxy Note 10.1 and the Asus Transformer Pad Infinity TF700T. To play in the top league, Sony installed the same SoC (System-on-Chip) as in their smartphone flagship Xperia Z. We're talking about a Qualcomm Snapdragon S4 Pro APQ8064A here, whose four Krait cores have a clock frequency of 1.5 GHz. It's accompanied by the Adreno 320, a graphics unit also known to be very powerful. The device has a luxurious 2 GB of working memory at its command, though that's quickly becoming the norm in the high-end market. Our test model came with 16 GB of internal memory; Sony has announced that they're making versions with 32 GB as well. But even the capacity of the 16 GB version can be expanded up to 64 GB using a microSD card. 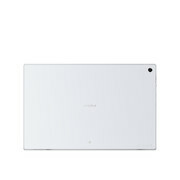 On the short left side, Sony situated the above mentioned "distinctive" power button and the very delicate volume rocker. Despite its delicacy, the rocker is easy to feel due to the slight protrusion of its "loud" side. All the controls and connections are slightly indented in the frame. The microSD and SIM card slots (blocked off in our test model) are located on the lower edge, along with the combined USB/charger port. The USB port also serves as video output, though an MHL adapter is required. An infrared sensor is hidden on the upper edge of the device, which gives the tablet the ability to act as a universal remote control. The device's software is now in its final state, though we didn't see any changes in comparison with the pre-series model. The operating system hasn't changed either. 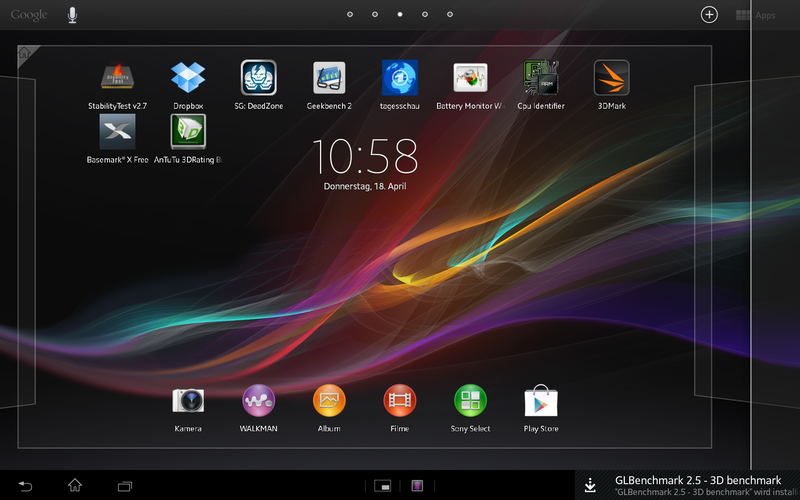 As before, Android 4.1.2 Jelly Bean runs on the Sony Xperia Tablet Z. However, Sony has just announced an update to 4.2. 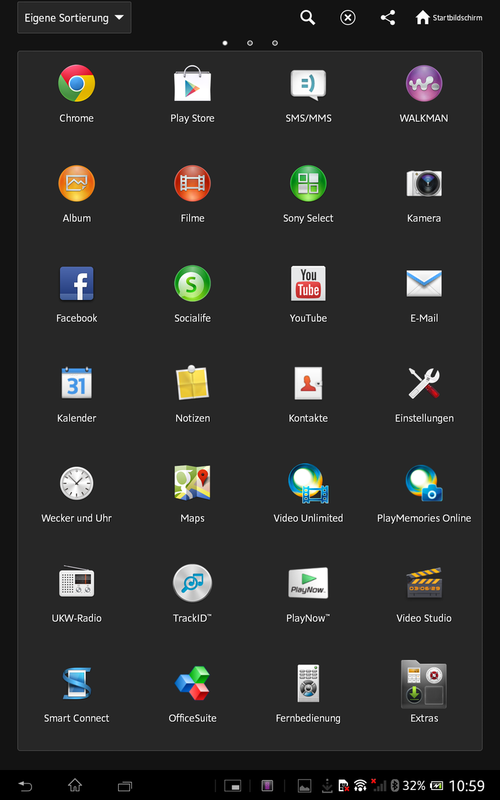 Sony furnished the Android system with their typical Xperia apps, like Walkman, Album, Movies and numerous others, some of which are very useful. 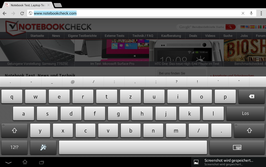 Also included on the tablet is a virtual keyboard in the Xperia layout. The keyboard has a very clean design. 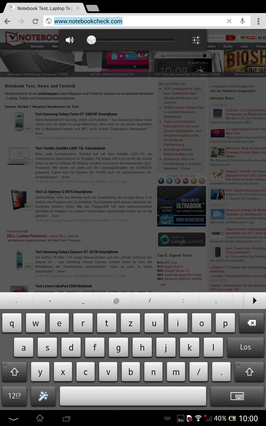 An additional row of frequently used special characters runs above the letters. To personalize the keyboard, the keyboard settings are found behind the magic wand key. Our pre-series device is the WLAN-only model. We were not informed as to which WLAN module Sony installed. Ultimately it's only unclear whether it's a dual-band variant. 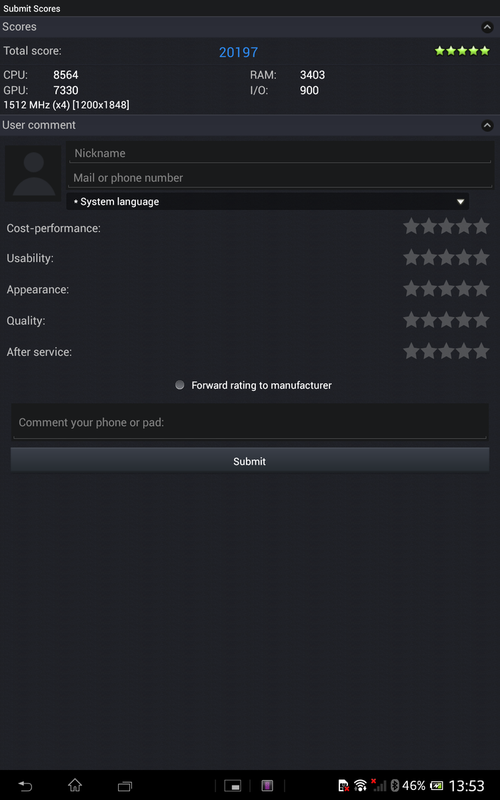 The smartphone Xperia Z doesn't have a dual-band module. The quick wireless standard LTE is offered on the Tablet Z for an additional fee. The German frequency bands 3 and 20 are also supported, along with bands 1, 5, 7 and 8. For communication over short distances, both Bluetooth 4.0 and NFC are at the device's command. 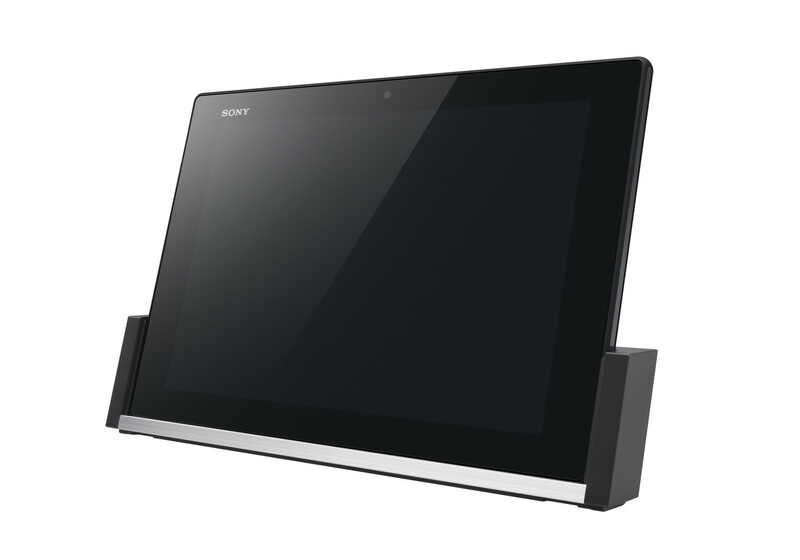 For tracking and navigation, the new Sony tablet uses an aGPS receiver that can also work with the GLONASS system. 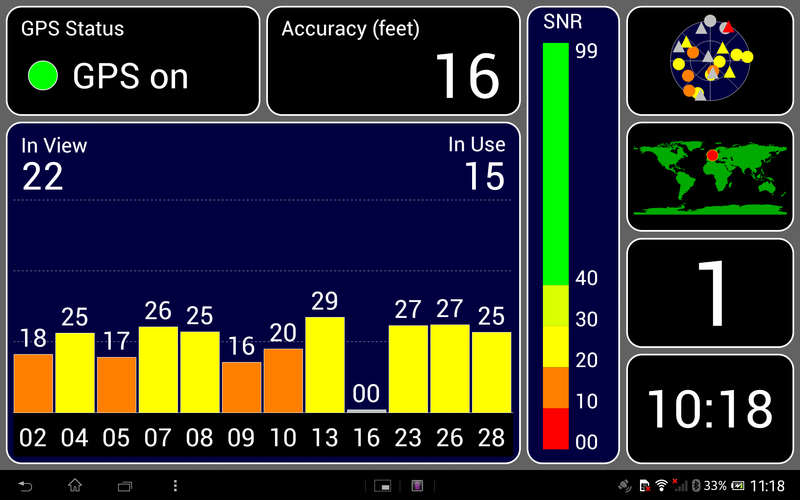 The GPS sensor's function leaves no room for doubt. After just a few seconds, the device finds enough satellites and makes a stable connection - even in enclosed spaces. Sony clearly took special care with their cameras - at least the press release dedicates a large section to the topic. The camera on the front side has a resolution of 2 MP, while the main camera on the backside has 8 MP. Both record film in Full HD. According to the manufacturer, what's special about the cameras are the built-in CMOS sensors named Sony Exmor RS, which are supposed to improve the device's light output considerably. Sony is using these sensors in a tablet for the first time. The features also sound more like a list from a digital camera than a tablet: Auto-focus with face and smile recognition, HDR mode, burst mode with 10 pictures per second, self-timer, image stabilizer, and scene detection. The camera app's controls are well thought-out. The volume rocker serves as the zoom. It's not a good idea to overdo the digital zoom, since it quickly deteriorates the picture quality. The sensor's light output is very high, but in diffuse light conditions image noise is still clearly visible. The front camera's image quality is good enough for snapshots at best. Overall the shots are too dark, grainy and blurry. Photos taken with the main camera are much better. During video recordings the Live View image constantly jerks a little. That jerking is noticeable in the videos themselves during quick pans. The Full HD recordings are about the same quality as the photos. There is a slight red cast over the images. But all things considered the video quality is respectable. The Sony Xperia Tablet Z package is modestly supplied. Alongside the tablet, only the obligatory power supply and USB/charger cable are included in the box. Sony offers a number of further accessories for purchase, like a stylish charging station that doubles as a stand for 39 Euros (~$51), a leather case for an almost shameless 79 Euros (~$103), or a protective film for the display for 19 Euros (~$25). 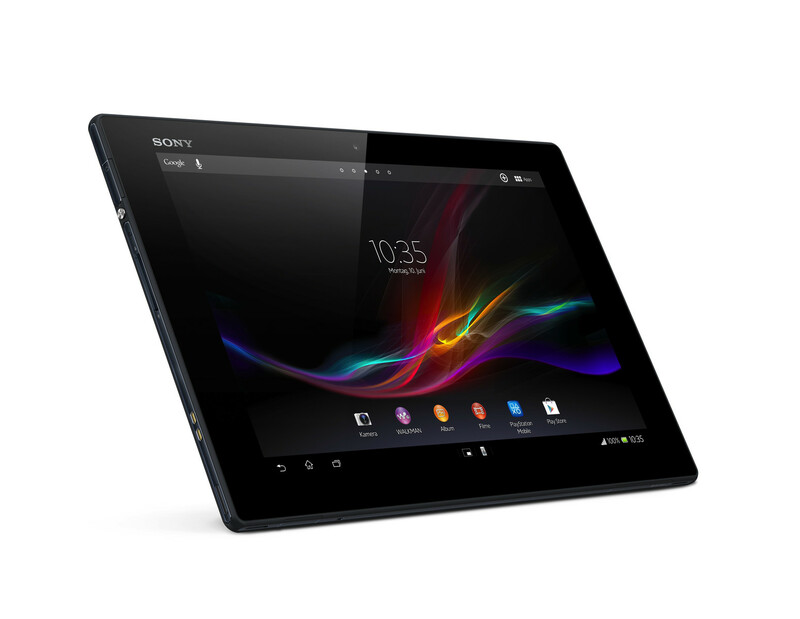 Sony affords the tablet a 24 month warranty. The accessories and battery are covered for 12 months. When the tablet is turned off, the transition from the display to the rather wide frame is hardly recognizable. 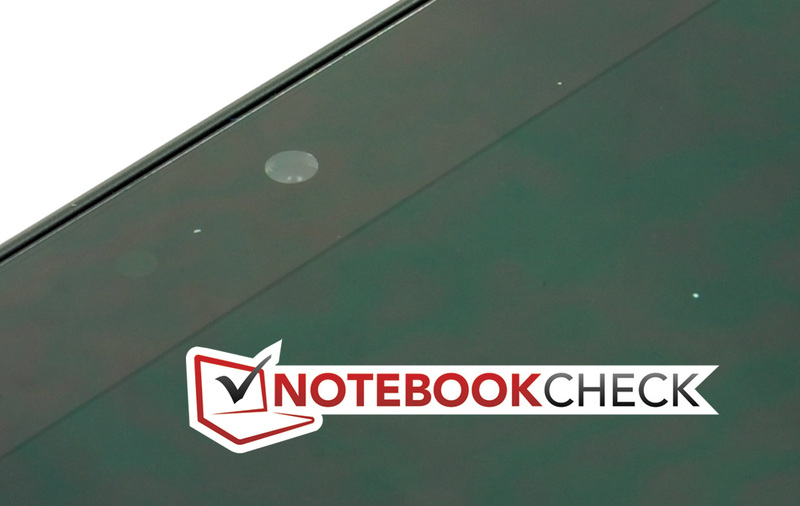 The whole front side attracts fingerprints like magic, but the operation of the Sony Xperia Tablet Z doesn't suffer for it. On the contrary: All gestures and touches are translated into commands immediately, and the controls work very precisely. From our point of view the control buttons, especially the power button, could have a more defined click point. But they work perfectly. 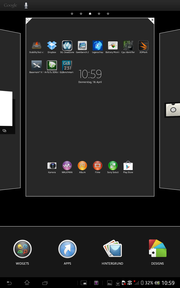 The tablet does need a second to execute its automatic rotation of the display. Sony outfitted their tablet with a 10.1-inch "HD Reality Display" with Sony Mobile BRAVIA Engine 2. At a resolution of 1920x1200 pixels the display is exactly on par with that of the Asus Transformer Pad Infinity TF700T. However, the Google Nexus 10 (2560x1600) and the Apple iPad 4 (2048x1536) offer considerably higher resolutions and thus also higher pixels densities (298 and 263 PPI respectively). The Sony Tablet Z "only" reaches 224 PPI. But text and graphics still appear very sharp - the size of the display content is simply reduced. The resolution is still completely sufficient. The panel is protected by a sheet of scratch-resistant mineral glass. Because our original test device's pre-series status was related among other things to the display and its tuning, we expected that Sony would make their most obvious alterations in this area. Let's take a look at the brightness, contrast and black value results. Here we see that Sony turned up the dial even higher on the tablet's brightness settings. In comparison with the pre-sample, the device's maximum light density went from 346 cd/m2 to a full 409 cd/m2. That helps the Xperia Tablet Z during outdoor use -- the screen content is now easier to read, possibly by a decisive margin. Sony also stepped up the black value. Instead of 0.4 cd/m2, the value now amounts to 0.5 cd/m2. Neither value is exceptional, nor is the contrast of 818:1, but in absolute terms these are all completely respectable numbers. Under (1) are our display measurements for the pre-series device, and under (2) our series model measurements. 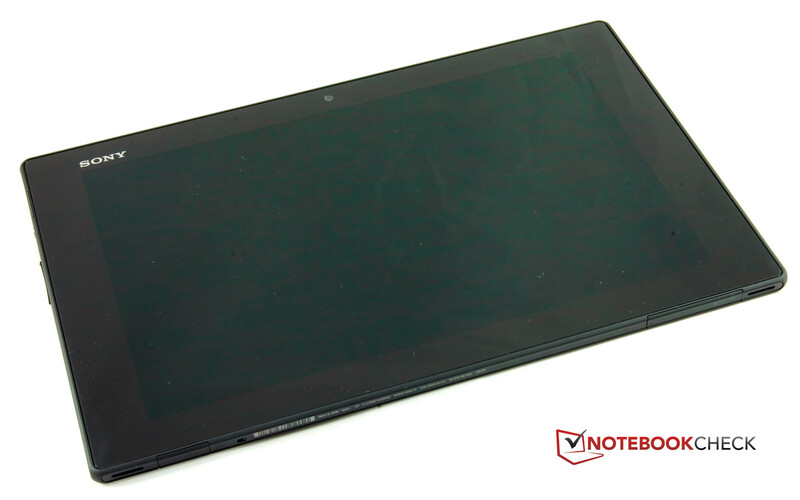 Subjectively, the image quality of the Sony Xperia Tablet Z hasn't changed since the pre-series sample, except that the display's previous yellow cast is no longer present. The colors displayed are bright and crisp; dark areas appear quite rich. We examine grayscale and color reproduction with the help of the Colorimeter X-Rite i1Pro 2 and the software CalMAN. Because Sony has spoken of an expanded color gamut, we ran the Color Checker for both the sRGB and AdobeRGB color maps. The manufacturer effected a clear change in the area of grayscale representation compared to the pre-series device, but "improvement" isn't exactly the right word. Quite the opposite: For one, the average DeltaE deviation of 4.7 for the grayscale is considerably worse than the previous average. Secondly, at 6164 K, the color temperature is significantly warmer. Meanwhile, the series model's color representation is somewhat more homogeneous than that of the pre-sample. Blue is still overemphasized. With the color checker we examine the display's color accuracy. Here for both color spaces -- sRGB and AdobeRGB -- we measure almost the same average DeltaE deviation of about 6.1. That's a respectable result, though the Sony Xperia Tablet Z doesn't even come close to the Samsung Galaxy S4's color accuracy values. The display glows quite brightly, but the glass plate is very reflective. As is, the Sony Tablet Z has in principal the same problem as most other tablets: The display content is difficult to see outdoors in bright sunshine. In the shadows the content is perfectly visible. In terms of viewing angle stability, nothing has changed -- and it's perfectly fine. Colors remain stable down to the flattest angles. A clear loss of contrast is only visible at angles under 30 degrees. First things first: Between the pre-sample and the series device, Sony made no changes to the Xperia Tablet Z's performance. In all our benchmarks the two test devices achieved almost identical results. However, considering the pre-series model's already good scores, we didn't expect any substantial improvements. 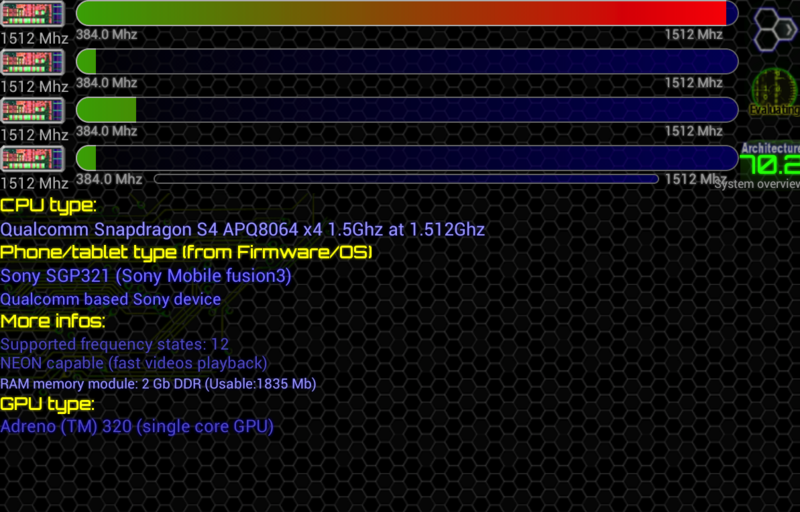 The manufacturer installed a quad core Qualcomm Snapdragon S4 Pro APQ8064A processor with a clock rate of 1.5 GHz. The Adreno 320 GPU sits beside it. There is 2 GB of RAM. This basic configuration exactly matches that of the Tablet Z's smartphone brother, the Sony Xperia Z, which we will also use as a comparison device. The Geekbench 2 benchmark ranked the Sony Xperia Tablet Z second amongst the comparison group - only the Google Nexus 10 achieved a 25% higher score. 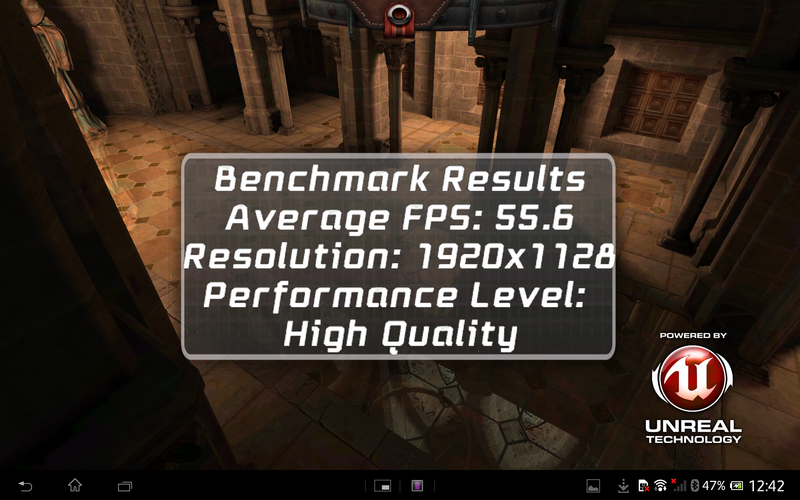 AnTuTu v3 confirmed the tablet's good result. In that test the Sony tablet climbed all the way to first place. 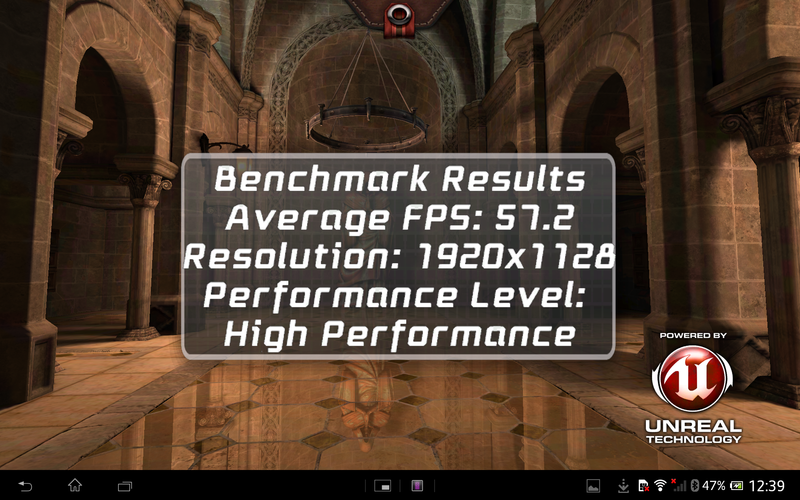 The graphics performance of the thin tablet is very good as well. The only competing devices strong enough to beat it are the Apple iPad 4 (which plays in its own league) and the Google Nexus 10. 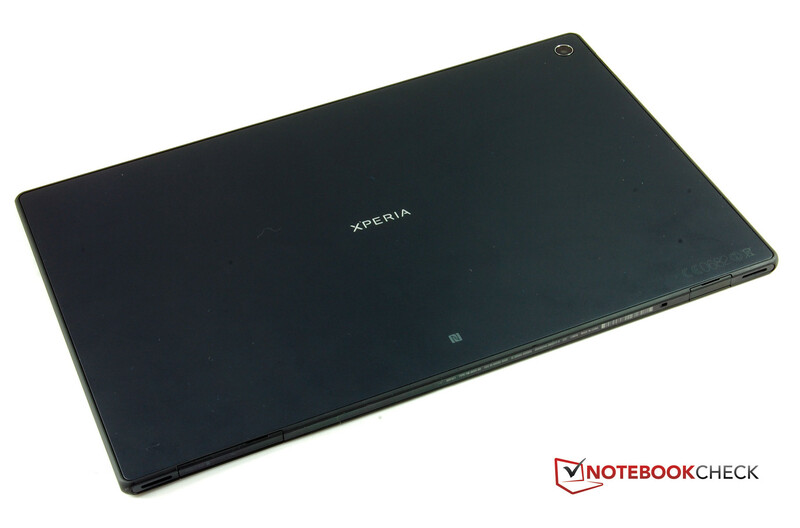 The Xperia Z smartphone comes in relatively far behind its tablet brother. In terms of internet performance, however, the two Sony devices were almost exactly on par with each other, though both Xperia models had to admit clear defeat to the Apple iPad 4 and the Google Nexus. 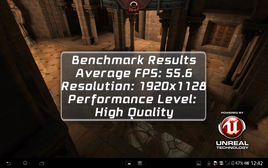 But all in all, the tablet's performance is respectable. 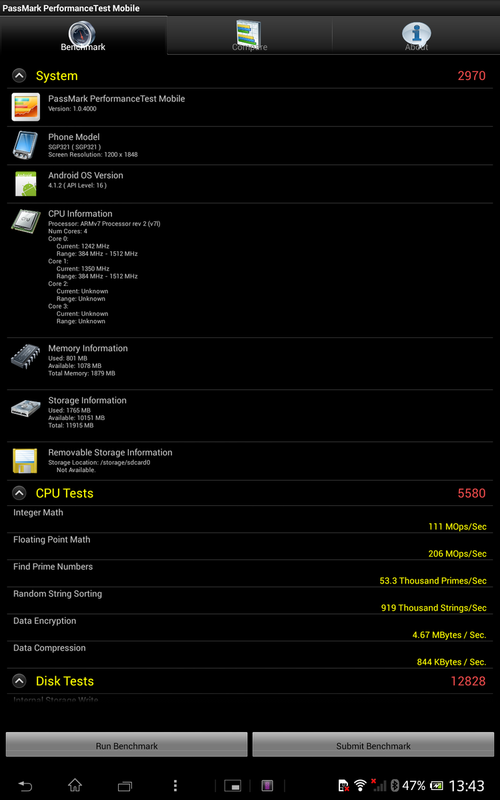 The Sony Xperia Tablet Z's internal memory also performed very well and earned the right to march proudly before the established competition, though the Google Nexus 10 continues to set the benchmark here - at least according to AndroBench 3. But taken alone, our tablet's results were certainly remarkable. In summary, we can certify that the performance of Sony's series device is very good. 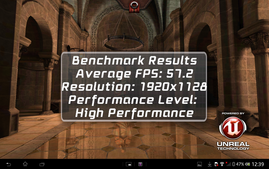 Compared to their pre-series device, Sony didn't optimize their tablet's performance any further. Due to the brevity of our time with the pre-series sample, we only tested the tablet's temperatures under full load. Because the pre-sample behaved unproblematically under full load, we assumed that the Sony tablet would also keep a cool head in idle mode. The series device confirmed our assumption. In only one of the many spots we measured did the flat tablet exceed the temperature of your hand. All in all, the device consistently remains comfortably cool. One the other hand, at 43 degrees Celsius (109.4 degrees Fahrenheit), the power supply becomes relatively warm both under full load and in normal operation -- but even so, that temperature is completely harmless. (±) The average temperature for the upper side under maximal load is 35.4 °C / 96 F, compared to the average of 30.7 °C / 87 F for the devices in the class Tablet. (±) The maximum temperature on the upper side is 43.4 °C / 110 F, compared to the average of 34.8 °C / 95 F, ranging from 22.2 to 51.8 °C for the class Tablet. (±) In idle usage, the average temperature for the upper side is 32 °C / 90 F, compared to the device average of 30.7 °C / 87 F.
Sony is practically exuberant in their description of the audio quality of their Xperia Tablet Z. 3D Surround Sound and ClearAudio+ are the labels floating around in the press. However, the sound quality didn't impress us. The two speakers are located left and right in the lower area of the frame. Sony chose to place them there so that the sound can develop freely when the device is lying on a table. 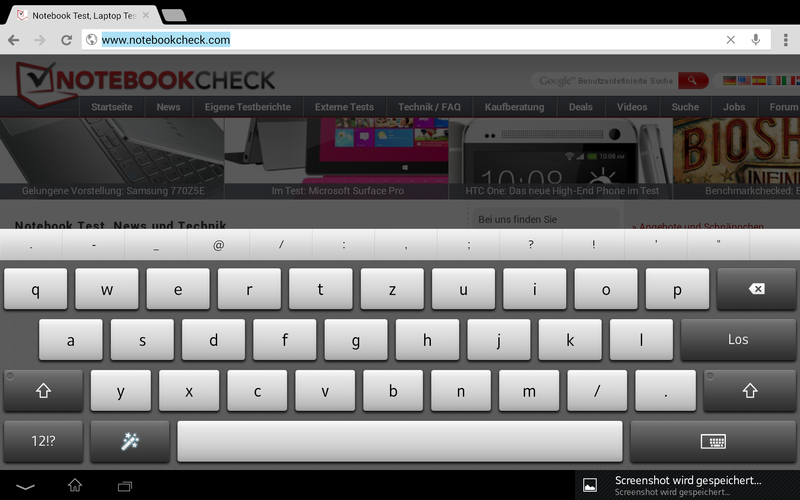 But this has a disadvantage: If you hold the tablet in the landscape orientation, your palms cover the speakers. From low to mid volume the sound is respectable; mid and high tones come across clearly, though bass tones are essentially non-existent. If you dial up the volume control to its maximum, the speakers begin to rattle and crackle. It would be better to get a good pair of headphones. 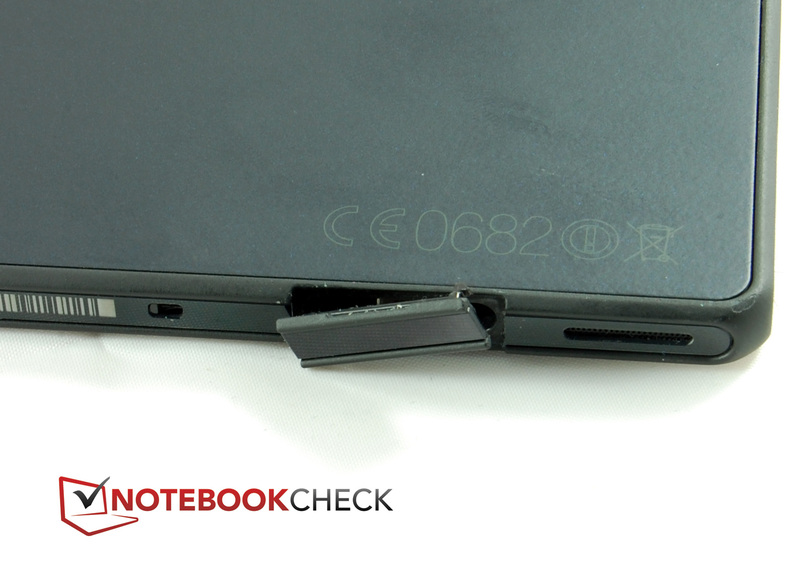 Sony built a 6000 mAh lithium polymer battery into their Xperia Tablet Z. That doesn't sound like much, but without a volt specification that information isn't very telling. The deciding factor for battery life is power consumption. Here our flat tablet proves to be very frugal. In idle mode, the energy draw lies between 1.9 and 4.7 watts. 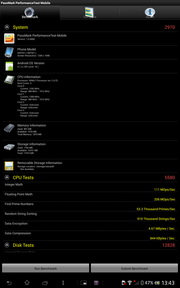 Compared to the Google Nexus 10, those are very small numbers. 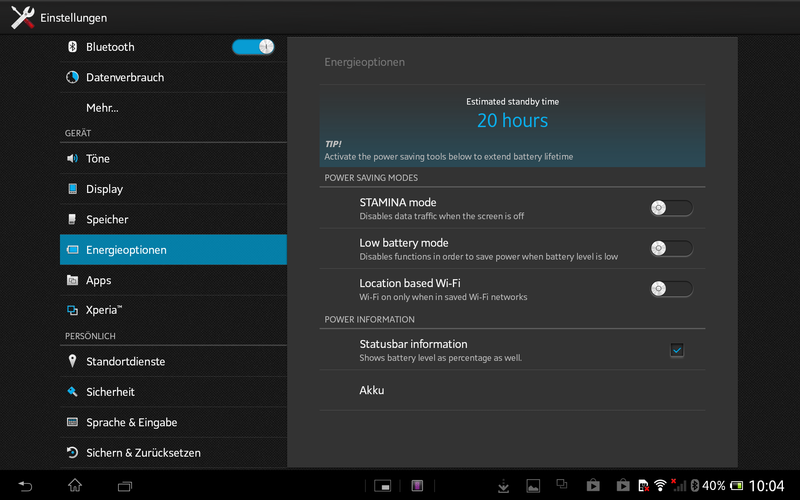 The Sony tablet's frugality is even more impressive under load: It never consumes in excess of 5.6 watts. Shut off, the device doesn't use any energy -- which is exemplary. However, in standby mode we measure a power draw of 0.4 watts, which for our taste is a little high. In the realm of battery life, we anticipated that Sony would make improvements to their Tablet Z before the release of their series device. The tablet's stamina under full load was already quite respectable -- and that's still true of the series device -- but in the WLAN surf test at a brightness setting of 150 cd/m2, the pre-sample only held out about 6 hours. Sony wasn't able to draw much more out of their series device here. 6:13 hours is comparatively little in the 10-inch tablet arena. However, at minimal brightness and with the power-saving mode activated, the tablet's maximum battery run time came to about 17 hours -- which is very long. All in all, a mixed performance in the battery discipline, particularly as the unit takes a whole 6 hours to recharge. 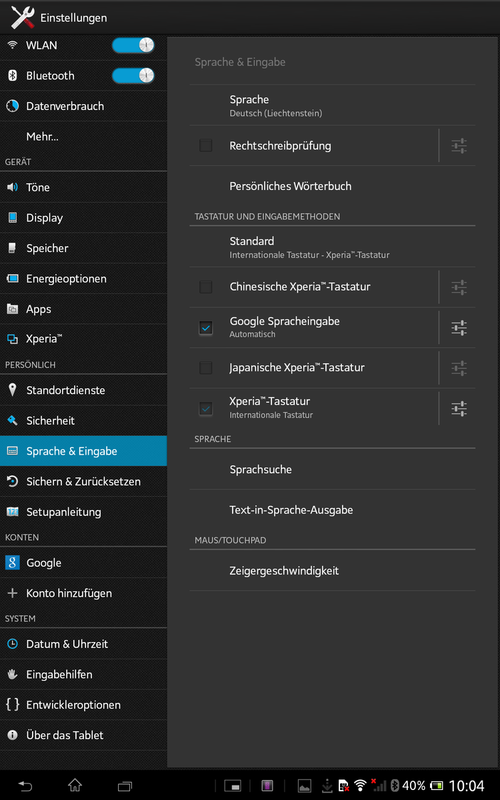 Already headed well in the right direction: The pre-series of the Sony Xperia Tablet Z. In our verdict about Sony's pre-series device we wrote: "The test device Sony lent us from the pre-series certainly whet our appetite." We would like to have seen improvements in the areas of camera and speakers -- but alas. However, Sony did improve their display -- at least in some respects. It glows more brightly now, but the contrast is now a little weaker. The display's color accuracy is also somewhat improved. On the other hand, the color temperature is clearly too warm, and the final tablet's grayscale deviations are greater than those of the pre-series device. The tablet's low power consumption made a good impression on us. However, because the battery doesn't have a particularly large capacity, the battery run times are a mixed bag. And at 6 hours, the time it needs to recharge is much too long. 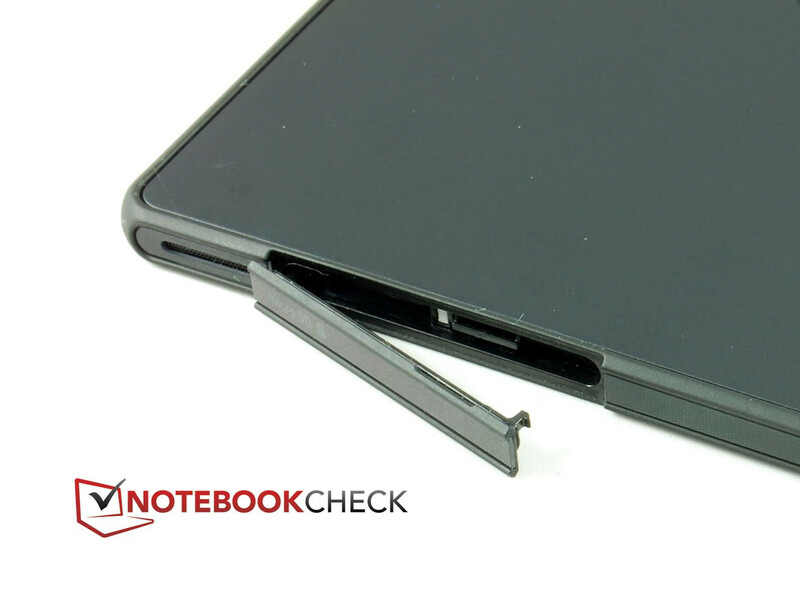 Because otherwise nothing has changed since the pre-series model, and the Sony Xperia Tablet Z in its series state attained almost identical results in our benchmarks, what we said about the pre-series device stands: "There's certainly nothing to improve when it comes to the tablet's inner components. The device's equipment meets the current upper-class requirements and afforded the tablet very good results in the first round of performance measurements. The case is very flat and light but should still endure "wind and weather". In could be more stable in our opinion." When turned off the display is hardly distinguishable from the frame. Said frame is rather wide. The Sony logo is the only design element on the front side. The camera is located in the middle of the top border. The main camera found its spot in the corner. According to Sony, the power button is "distinctive". 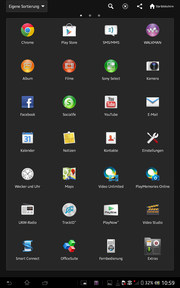 This is how the launcher looks. And this is how apps and widgets are added to the home screen. 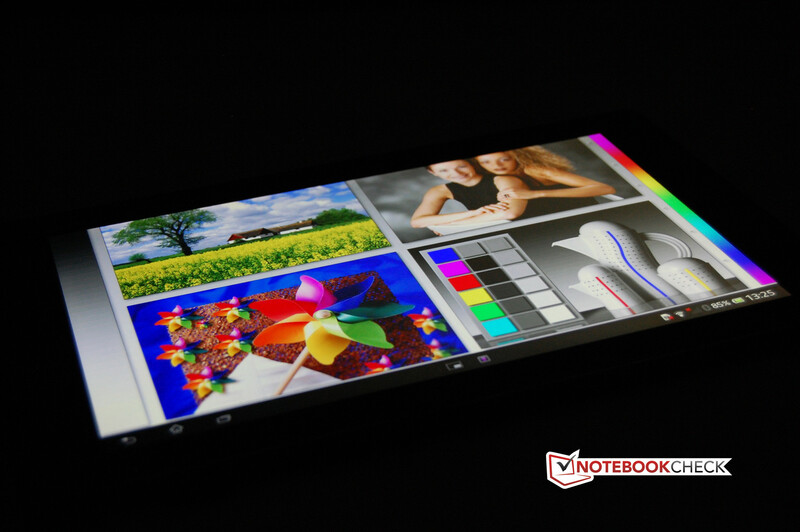 The tablet is also available in white. The optional loading dock doubles as a stand. 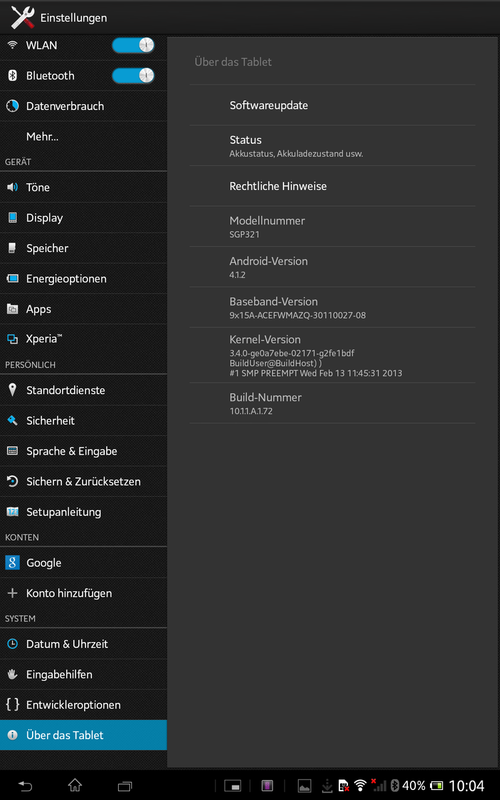 System info Xperia Tablet Z. The elegant look, the extreme thinness and the comfortable weight. A more stable case would suit a device in the top class well. That Sony made the display brighter and its colors more accurate, but the grayscale deviations and color temperature problems worsened. 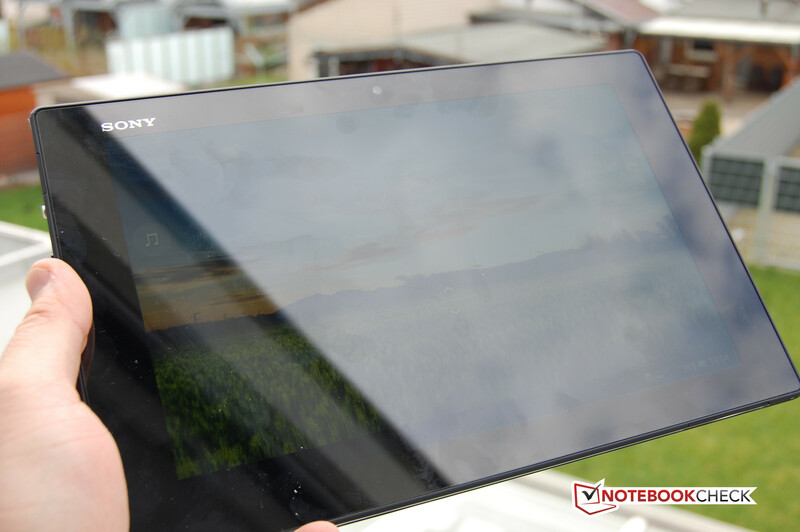 The Sony Xperia Tablet Z wants to play in the top league. Therefore the competitors are: the Apple iPad 4, Asus Transformer Pad Infinity TF700T, Google Nexus 10 and Samsung Galaxy Note 10.1 – the crème de la crème, that is.